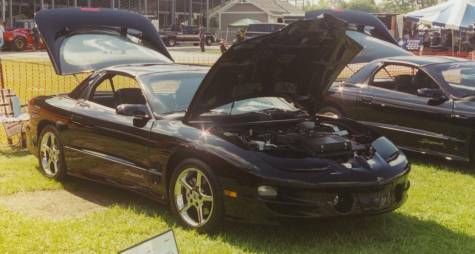 Above, 2000 Firehawk #453 on display at the car show. Members of the Firehawk Assn. got to judge each others cars for club trophies, and the Ames judges ranked them as part of the Pontiac Nationals car show. 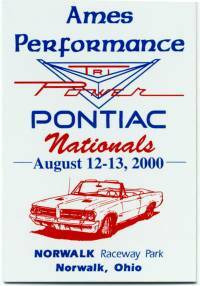 On Sunday, the Firehawks and Comp T/A's got to run against each other on the Norwalk raceway strip. Here's a pair of Comp T/A's coming out of the water. Matt Bennett, in the "Budweiser lane," practicing a toll booth exit. Over 40 Firehawks and Comp T/A's showed up. And quite a group of 30th anniversary T/A's, too. We might have had the GTO's outnumbered. . .
beat on the decibel scale. At the swap tables, you could find what you needed to rebuild a classic, or an awesome brassiere. Here's my 2000 #453 next to Mike & Rhonda Webber's red 2000 #309. 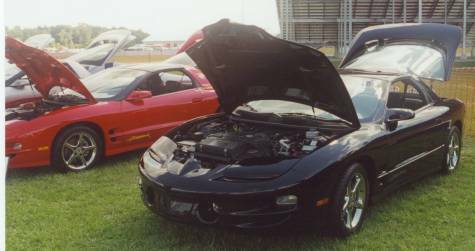 The Ames judges gave the red one second place, and my black one third place for the 2000 model year in the Pontiac Nationals show. Coincidentally, both these cars came out of the Madison, WI, Don Miller dealership. Mike and Rhonda also got a club trophy for their gorgeous red Firehawk. Congratulations, guys!